Who is he? Who knows – he’s wearing a mask. Zorro? The Lone Ranger? A cat burglar? Who know – but I recently found this masked man lurking in the map of Victoria, BC, and I had to cycle 37 kilometres (23 miles) to flush him out. Again, this doodle was one continuous route, though the quick-paced straightaways were punctuated by stairways and steep rocky paths that required me to awkwardly “portage” in my cycling cleats. To flush this masked man out of hiding, I had to cycle 37.1 kilometres (23 miles). Note: I rotated the mapped image 90º CCW for ease of viewing. 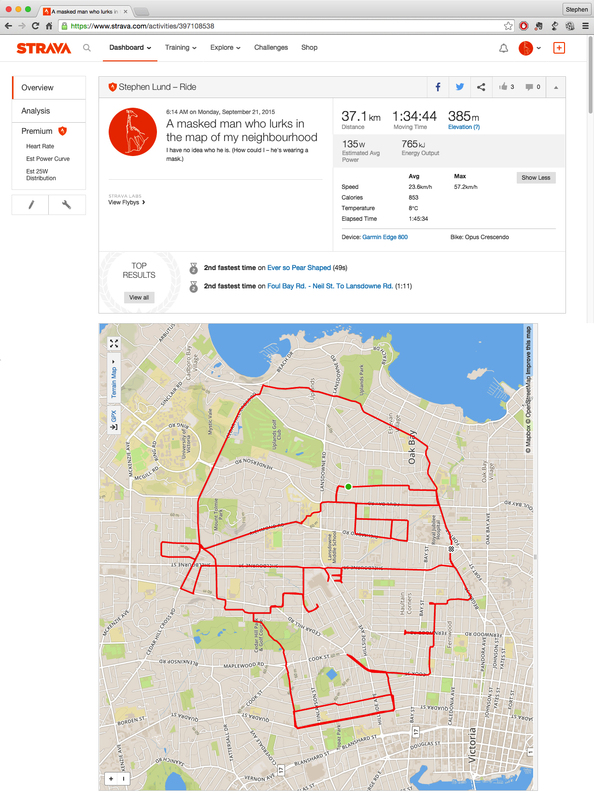 This entry was posted in gps art and tagged bicycling, creativity, cycling, garmin, gps, gps art, Lone Ranger, mask, strava, strava art, victoria bc, Zorro. Bookmark the permalink.